Bleacher stadium seats provide a secure, cushioned seating surface to help you withstand uncomfortable stadium seating (Source). Some common amenities include armrests, supportive backrests, storage pockets, bleacher attachments, collapsible designs, integrated handles/shoulder straps for transport and adjustable positioning (Source). Some of the stadium seats will hook or attach (the Rio Adventure, Cascade Mountain Tech, and the Stansport) to the seat, providing back support especially when a bleacher seat doesn't have a back rest. The other options (the Coleman and Ventura) don't attach, so they're better for stadium bleacher seats with back rests you can prop it up against. The Cascade Mountain Tech stadium seat is one of our favorites- unlike other seats, you can purchase it in 2 different sizes. The Regular stadium seat is 17" across, while the Wide seat is 20" across- the additional seating surface on the Wide has reportedly accommodated individuals over 6'5", weighing over 300 lbs. It uses an under-mounted hook to stabilize and secure it on hard, bleacher stadium seats. It also folds up so that you can tote it around using an integrated handle like a briefcase. This stadium seat offered by Coleman is comfortable, spacious, well-stitched, and an excellent choice if you want a soft spot to sit on. Users love the mesh seatback pocket, but some do note that it’s flimsy. The Coleman stadium seat measures 5.7” x 5.8” x 14.8”, and it features a water-resistant back and bottom plus a shoulder strap, which is great because you can carry it wherever you go. Another great thing about this seat is that it rolls up for storage and you can unfold it into a bench pad. This blue stadium seat has a 1-year limited warranty. In general, users have a favorable opinion of the Coleman stadium seat, and they are pleased with its softness and design. A buyer comments that the seat is very comfortable and that it’s the ideal solution for people who enjoy visiting the stadium but can’t sit on hard surfaces. He adds that the seat is easy to carry around and that you can adjust it to the position you want. Another reviewer observes that the seat keeps you from getting cold when you sit on plastic benches and that it’s really water-resistant. A user adds that he highly recommends this stadium seat due to the low cost and the user-friendly design. However, some customers have said that the fabric tore up after a few weeks and that the seat is not as durable as they expected. Some users also complain that it’s not suitable if you want to have a sturdy support for your back. If you are looking for a portable stadium seat of top-notch quality, you might take a look at this reclining seat offered by Picnic Time. Users love the integrated armrests that provide addition comfort, but some do note that it’s not as easy to carry it as they expected. The Picnic Time portable seat measures 32” x 20” x 2” when it’s folded, and it features a polyester-covered padded cushion, a sturdy steel form, water-resistant bottom, and an adjustable backpack shoulder straps. Another great thing about this seat is that you can adjust it to six different positions, and it has a zippered pocket on the back. The manufacturer backs it by a lifetime guarantee, and it’s available in several colors. A purchaser comments that this padded seat for bleacher is extremely comfortable and that the back offers sufficient support. He adds that he spent nearly ten hours sitting in it, and he didn’t feel any discomfort. Another buyer comments that he has been using the portable stadium seat for almost two years and that it’s still in an excellent condition. He highly recommends it as the best stadium seat for people with back issues. A user also states that the Ventura stadium seat is very handy and that it allows you to enjoy the basketball game fully without worrying about getting cold However, some customers have said that the seat started to come apart after several months and that the straps tore quickly. This padded stadium armchair offered by Rio is well-made, easy to transport, and attaches quickly to the bleachers. Users love the beverage holder and the storage pocket, but some do note that it’s not as comfortable as they expected and that it slides. The Rio Adventure stadium seat measures 16.5” in width, and it features a padded armrest and bottom, an angled backrest, a single buckle attachment strap, and a shoulder strap which is great for transport. Another great thing about this chair is that you can easily fold it (12” x 10” x 4.5”) when you’re not using it. What’s more, the weight capacity of this padded seat for bleacher is 225 lbs, and it’s available in several colors. A customer mentions that the stadium chair is very light and that you can carry it with no issues. He adds that it works great on all types of stands and that even a large person can sit in it comfortably for hours. Another buyer shares that the padded seat cushions his back well and that it’s easy to secure it to the benches. A reviewer also comments that the padded stadium seat is a necessity for any sporting event and that it keeps him from freezing during a long game. However, some customers have said that the stadium seat is flimsy and that the fabric ripped very quickly. Some users also note that it’s not very easy to fold and unfold it and that it doesn’t have a sufficient back support. If you are looking for a top-rated stadium seat, you might take a look at this padded chair offered by Cascade Mountain Tech. Users love the eight color options, but some do note that it’s heavier than they anticipated. 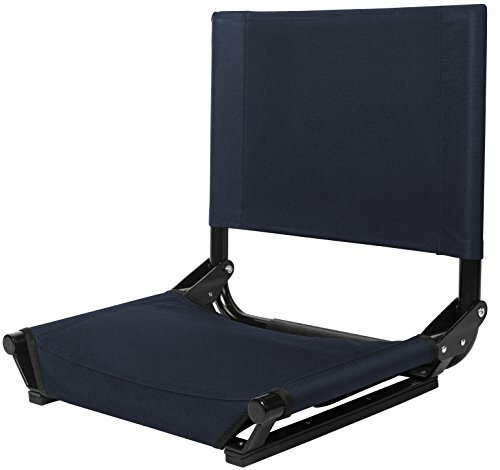 The Cascade Mountain Tech wide stadium seat measures 20″ x 14″ x15″, and it features a comfortable canvas design with bungee cords for reinforcement, a strong steel frame, under-mounted stabilizers for security, and a weight of 9 pounds. Another great thing about this padded seat is that you can easily fold it for storage, and it has a cushioned handle for transportation. In general, users have a very high opinion of the Cascade stadium seat, and they praise its design and durability. A reviewer observes that the frame is solid and that it’s easy to fold and unfold the seat. He adds that the seat holds his weight of 330 lbs with no issues and that the backrest provides sufficient support for the lower back. Another buyer comments that the seat doesn’t slide at all and that it’s a piece of cake to secure it to the bleacher. A user also states that this is one of the most comfortable stadium seats that he has ever used and that he highly recommends it. However, some customers have said that the seat is too heavy to be carried comfortable around and that you can feel the cords when you sit on it. 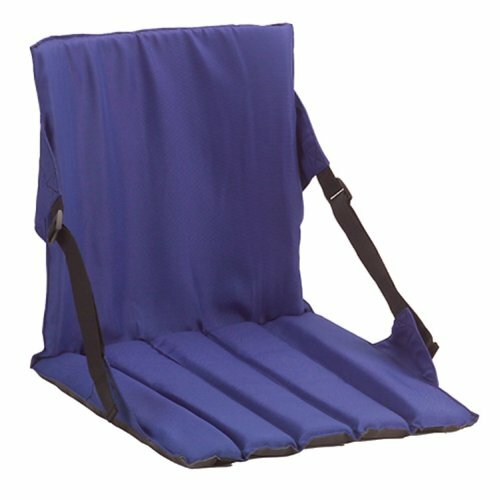 This portable stadium seat with arms offered by Stansport is practical and available in three colors. Users love the collapsible design which doesn’t require assembly, but some do note that the seat is not very comfortable. 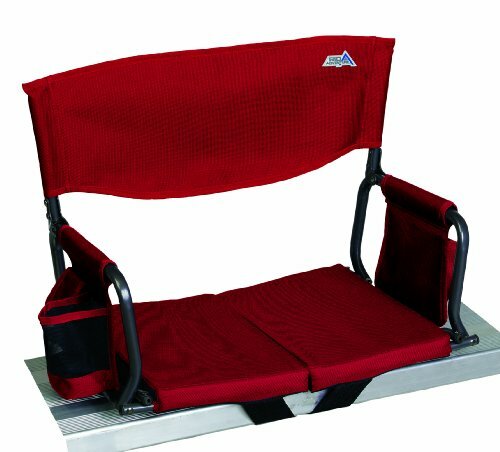 The Stansport folding stadium seat measures 19” x 17” x 5.5”, and it features an adjustable shoulder strap for transportation, a steel tubing frame, a steel hook for attaching the seat, and a weight of 4.4 pounds. Another great thing about this seat is that it has a large back pocket so that you can store water or personal possessions. In general, users have a mixed opinion regarding the Stansport padded folding bleacher seat, and they agree that the design needs improvement. A happy reviewer mentions he is very pleased with this folding bleacher chair and that it’s easy to fold it. However, he notes that the padding is on the thin side. Another customer mentions that the seat turned out to be more comfortable than he expected and that his 65-year-old father uses it with no issues. On the other hand, an unhappy buyer comments that the steel bar of the seat digs into your leg and that the hook is not strong or durable enough to secure the seat. A user also states that the seat started to tear very quickly and that it’s not comfortable to sit in it for hours. The first stadium seat we examined was the Coleman option- it is a mesh and water-resistant seat that also unfolds transforming into a bench pad. Conveniently, it comes equipped with an integrated shoulder strap and you can roll it up for storage purposes. It's marketed as a handy and portable comfort aid whether you are watching a baseball, football or hockey game. Buyers say that it provides some lower back support, as well, when you are sitting as the side straps provide some lumbar tension. One buyer who suffers from spinal stenosis, lower back pain and a bruised tailbone tells us that normally sitting on hard seats is incredibly painful. However, this option helped insulate her tailbone from pressure point soreness during high school football matches on hard bleacher stadium seats. Another reviewer we interviewed says that the lightweight and portable Coleman stadium seat somewhat resembles a medical-grade cushion- though one moderate criticism is that it is not as stable as they would like because it is a little bit wobbly. 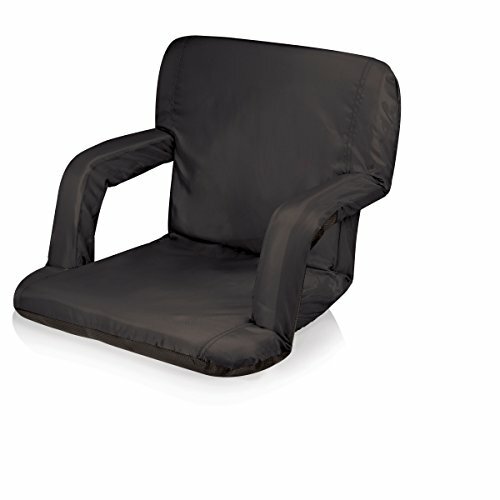 The second option we examined was the Harley Davidson reclining stadium seat- it is a polyester, cushioned option but is reinforced with a steel frame that can help to adjust to six different resting, seated positions. Because it features integrated shoulder straps, you can easily tie this onto your back for mobile transport. It's marketed as a particularly durable, convenient and comfortable option designed to provide cushioned seating whether you are catching a concert, hanging out at the park, or taking in sun and waves at the beach. Since it folds flat, it's pretty easy to store, becoming a particularly convenient option while on the road. One reviewer discovered a novel use for the stadium seat- it began pouring rain at their son's high school football match and by flipping the seat over their head it became an umbrella to protect them from the downpour. This seat doesn't actually clip to bleachers or benches, but on the whole buyers tell us that it provides solid balance when you are settled in it. The third stadium armchair we examined is provided by Rio Brands- you can purchase it in red, navy and black colors. This option does attach to bleachers and provides armrests as well as a cushioned seat that can support individuals weighing up to 225 pounds. As well, it comes equipped with storage pockets and an integrated beverage holder. 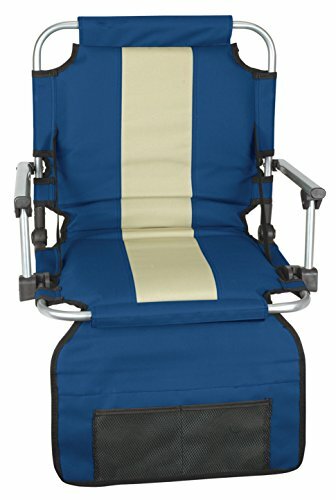 Built from canvas, with a wide backrest designed to provide back support, it utilizes a buckle strap to attach to the bleacher's seats. It's important to note that there needs to be an open space between the back of the bleacher and the seat so that you can thread the buckling strap through to tie it down. One buyer was impressed by the ease of transport saying that it is lightweight and has withstood use from overweight buyers using it for extended periods of time. Another reviewer was unimpressed saying that because the seat bottom doesn't have gripping fabric that it slides around too much even when strapped to gymnasium stadium seats. 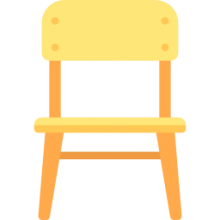 Other reviewers were more forgiving, telling us that since their children perform in high school musicals outdoors and indoors, this stadium arm chair has provided comfortable seating during extended musical performances. The fourth option we examined was provided by Cascade Mountain Tech- the chairs come in a variety of colors including green, maroon, orange, purple and red. They are marketed as a soft cushion and canvas options with integrated steel frames that easily fold up for storage and transport. This option uses a hook to secure it to stadium bleacher seats and comes with a handle so you can carry it like a briefcase. Also, it's important to note that there are two different width sizes available- a regular that is 17 inches wide and a wide that is 20 inches wide. Buyers have provided primarily positive feedback- they were particularly appreciative that two sizes are provided to accommodate users of different dimensions. One especially large-statured reviewer who stands over 6 foot five weighing over 300 pounds says he was surprised at how well the seat withstood his ample frame, commenting that it provided lumbar support comfortably. Another buyer who enjoys watching local baseball games outside on bleacher stands in the spring and summer months comments that it was a worthwhile investment that made viewing much more comfortable. The last option we took a look at was the Stansport folding stadium seat- it is a collapsible option that includes an integrated storage pocket as well as shoulder straps for transport. It's marketed as a comfortable complement for sports stadium connoisseurs as well as concert goers looking for padded cushioning to provide seated comfort. It includes a steel hook so that it will attach to bleachers. One buyer was not impressed, criticizing it because it seems designed to accommodate only smaller statured people. In addition, because this individual weighed over 250 pounds, they could feel the uncomfortable surface of the metal bleachers pressing into their buttocks. Other reviewers were more pleased, telling us that it was a solid value buy that packs in reasonable amounts of storage capacity if you want to load up on snacks, water bottles, and newspapers while enjoying an outdoor concert. Indeed, seasoned stadium seat sitters comment that armrests and back support are indispensable if you will be sitting on a hard outdoor surface for hours at a time.